Memorial Day is just around the corner and that means the unofficial start of summer in Maine! The snow is gone (finally! ), and we're ready for some fun in the sunshine. We gathered up our five favorite activities to do in Maine on Memorial Day weekend below. Just about every town in Maine will be hosting a parade sometime over the weekend to celebrate the lives of those who gave the ultimate sacrifice during their military service. If you're in our area, consider attending the Memorial Day Parade in Lewiston on Saturday, May 26th. All are welcome. The unofficial start of summer often means opening weekend for the many campgrounds throughout Maine. Luckily, there are lots of great options throughout the state of Maine including in our local area. Our favorites? The Birches Campground on Cobbosee Lake and Beaver Brook Campground on Wilson Pond. Most campgrounds have planned activities ready to keep your whole family entertained for the weekend - the hardest part for you will just be getting there. Summer in Maine means our seasonal ice cream shops throughout the state will be un-boarded and open for business! Just about every town has a local shop, but one shop that has becoming especially popular in our area in recent years is Fielder's Choice. This family-owned shop started in nearby Sabattus and has since expanded to other locations throughout the state including Old Orchard Beach, Auburn, Manchester and Brunswick. With a large menu (including dairy-free options!) and great prices, your whole family will be thrilled with this activity. For some, a long weekend means time to shop! Maine has two great cities that are known for their outlet shopping - Kittery and Freeport. Both towns are great places to spend a day of shopping and exploring. If you're more interested in a variety of stores, we recommend making the trip down to the Kittery Outlets. If you're bringing your family, you may want to consider Freeport which is also home to one of Maine's most famous places - LL Bean. 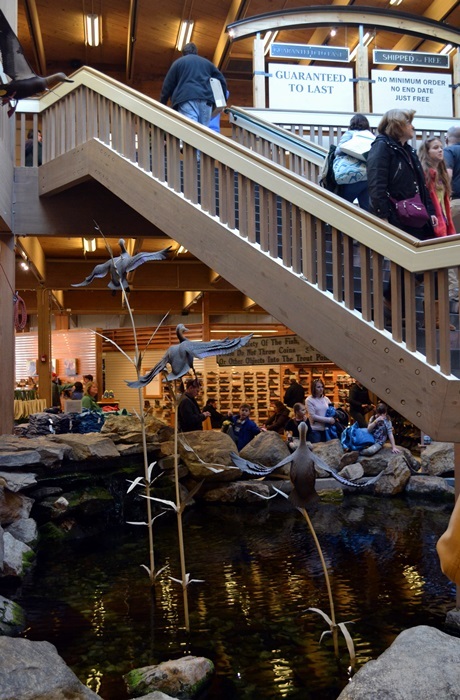 Featuring an indoor trout pond and other wildlife scenes, LL Bean brings the outdoors inside making it a great stop fo keeping your entire family entertained while you shop. With the snow gone and the warm weather finally here (fingers crossed! ), there's no better time to get outdoors, and we're lucky to live in a place that has so many options for outdoor fun! If your family loves animals, we recommend visiting DEW Haven - a fantastic place full of both local and exotic wildlife. More into plants and flowers? Consider checking out the Maine Botanical Garden in Boothbay. And lastly, if you prefer to explore your own backyard - nothing beats a hike through the forest or long walk on the beach. To find out great walks in your area, check out Maine Trail Finder. Did we miss anything? Be sure to share your own favorites in the comments!